The Fahrenheit 9/11 director cut his Broadway show, The Terms of My Surrender, short as he joined the Avengers star and a group of people to board double-decker buses to Trump Tower on 6th Avenue. “We want him to hear us,” Ruffalo said in an Instagram video, in response to the president’s remarks following the neo-Nazi and white nationalist protests in Charlottesville, Virginia, over the weekend. The stars organized a sort of vigil for 32-year old Virginia-native Heather Heyer, who was killed as a result of James Fields Jr. ramming his car into a counter-protest march that took place in downtown Charlottesville moments after the Unite the Right rally had been cleared by law enforcement. Actress Olivia Wilde joined the protests and led the crowd in anti-Trump chants. “Trump is not a legitimate president! Trump is not America! We love America!” said Wilde, whose mother is a U.S. House candidate in Virginia. Earlier in the evening Moore had teased a “surprise guest” and that he would take his audience somewhere. 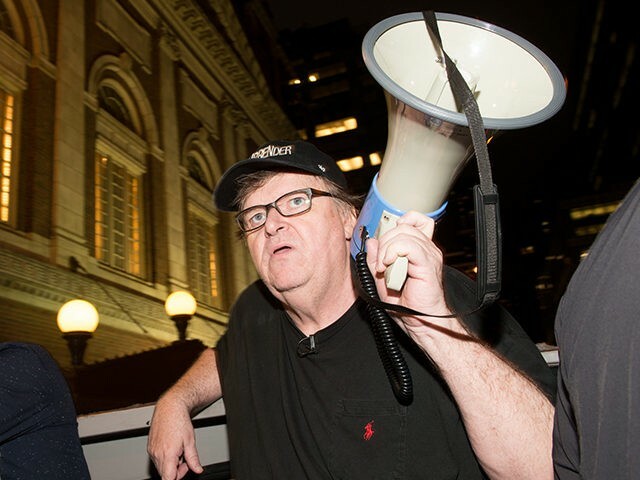 After the rally, Moore took to Twitter to fire off a series of anti-Trump tweets and call on his supporters to boycott the businesses of CEOs who sit on Trump’s various advisory councils. …Walmart, Pepsi, anything by GE, IBM computers, Dow Ziplock bags, 3M Post-It Notes, Tylenol, Corningware and Motrin. Boycott them all.